The gig economy is changing how IT works. In fact, many significant innovations such as WiFi, mobile devices, and cloud infrastructure are changing how IT admins need to manage their networks. Even the concept of the network itself has completely changed. Long gone are the days of a wired network with everything located on-prem. The users of the network aren’t even on-prem anymore! So, the question becomes – how do you solve remote user and device management in this new environment? Historically, networks were largely on-prem and Microsoft Windows-based. A few resources were located off-prem – perhaps servers at the data center, but these were often connected to the headquarter location via a VPN. 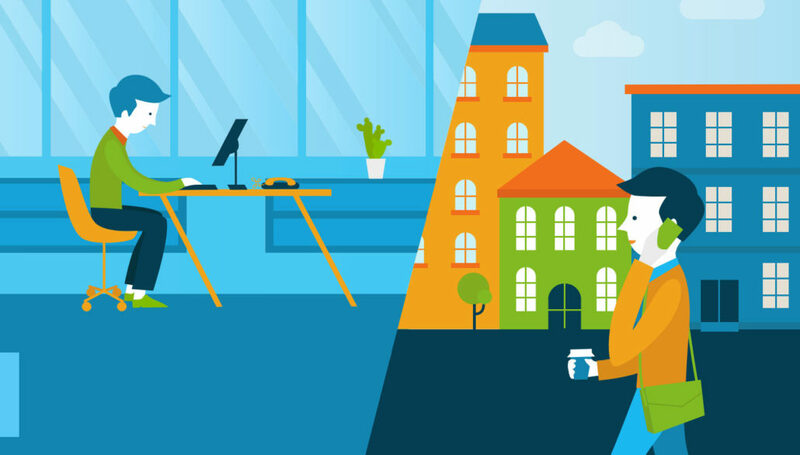 Remote users were generally remote sales people who would be working from home offices. These users, too, were connected back to the headquarter location via VPN. Applications would be hosted on-prem as well. The world looked very different in the late 1990s and early 2000s. IT management tools were built around the on-prem Microsoft Windows model. Microsoft, in fact, dominated the management tool space with solutions such as Active Directory® and SCCM. Active Directory was the monopoly in the identity management space. IT admins would control access to IT resources via AD and ultimately would create a domain where the user could login and have access to their system, applications, and network file shares. On the device management side, Active Directory’s GPO feature could be used to manage Windows machines If a more robust solution was needed, IT admins turned to SCCM. Of course, the IT world exploded with change over the subsequent decades. Microsoft Windows devices gave way to Mac and Linux systems and mobile devices from Apple and Google. In fact, only one in five devices is now Windows-based (Forbes). Applications shifted to the cloud in the form of SaaS applications, and the data center shifted to the cloud with AWS dominating the Infrastructure-as-a-Service space. Wired networks converted to being WiFi. Perhaps one of the most important changes of all was that users became more mobile, working from anywhere in the world. All of these changes placed huge pressure on the IT organization to manage the increasingly complex environment. Traditional IT solutions such as Active Directory didn’t cut it any longer. In fact, Active Directory became a limiter for IT organizations looking to shift to the cloud and leverage modern technology. Device management technology via GPOs or SCCM were tied tightly to Windows, so Mac, Linux, and other platforms were often treated as second class citizens. Neither of these approaches would work for modern IT organizations. The massive shift in IT spawned a new generation of IT management tools. One of the most interesting has been Directory-as-a-Service®. As a modern cloud identity management platform, think of the cloud directory as the reimagination of Active Directory for the cloud era. The SaaS-based directory services solution works with mixed platform environment such as Windows, Linux, and Mac. It connects to cloud infrastructure such as AWS or Google Cloud. It seamlessly integrates with G Suite and Office 365. It leverages multiple protocols such as LDAP, RADIUS, SAML, SSH, REST, and more. The cloud directory can execute commands and policies remotely on devices to set password complexity, screensaver lock, and much more. On top of all of that – and perhaps the most interesting of all in the remote user and device management context – it doesn’t matter where the users or IT resources are located. There are no VPNs required, but IT admins are still able to manage user access as well as the device remotely. 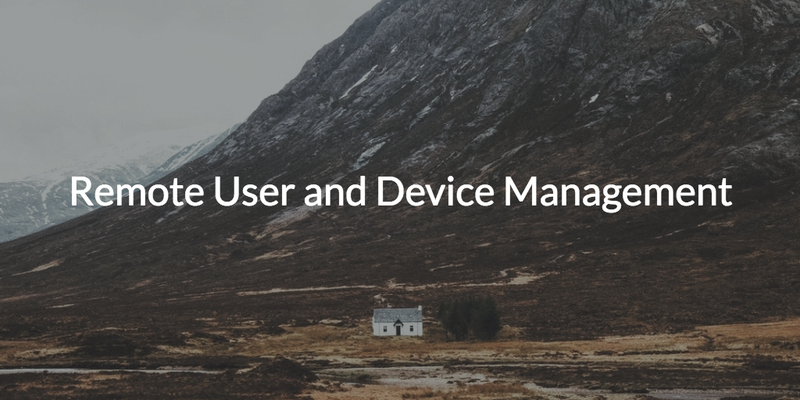 If you would like to learn more about how to remotely manage users and devices, drop us a note. Alternatively, sign-up for a free JumpCloud IDaaS account and check it out for yourself. Your first 10 users are free forever.